Lower tray and front wheels keep loads from tipping. 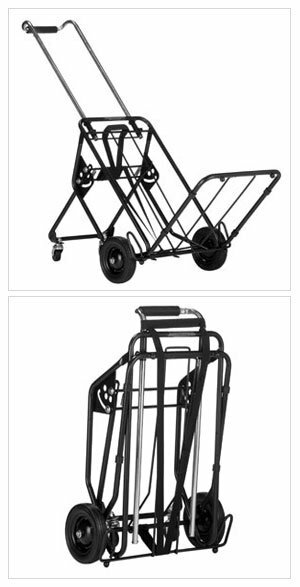 Features rear folding wheels that fold flush to the cart for easy storage. Rear wheels stabilize the load, takes the weight off your back and arms. Easily raise and lower rear wheels with foot. 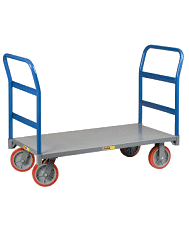 Features Elastic Straps for securing loads to the cart. Wheels guards in front of wheels to protect soft cases from rubbing on the wheels. The single motion squeeze handle telescopes cart closed for space-saving storage & portability while traveling. So far the cart has been a great help to my back while transporting a 80# keyboard plus accessories. I did notice a bent wheel the other day. I don't know if it was bent out of the box or it just isn't strong enough for the application. For carrying an 88 key keyboard at times I wish the handle extended farther. Considering it is a 'general purpose truck it does a good job for my application.